Situated 31 miles (50km) from Mexico City, the UNESCO World Heritage Site of Teotihuacan is Mexico's largest ancient city, dating from around 300-600 BC. Legend has it the Aztecs found the abandoned city and, recognising signs of its previous magnificence, they named it what it is today: Teotihuacan, 'place of the gods'. 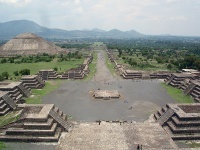 The central thoroughfare of Teotihuacan is the Avenue of the Dead, a 1.3 mile (2km) stretch connecting the three main attractions. The Pyramid of the Sun is the third largest pyramid in the world, a huge red painted structure over a cave with spectacular views from the top. The smaller, more graceful Pyramid of the Moon contains an alter believed to have been used for religious dancing. The Citadel is a large square complex that was once the residence of the city's ruler. Within the walls is its main feature, the Templo de Quetzalcoatl. Opening times: Tuesday to Sunday 9am-5pm.